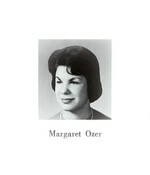 I am sorry to report that one of our Mumford class of '61 classmates Maggie Ozer Cadman died this afternoon in New York City. She was diagnosed with advanced stage liver cancer in mid-November and went into hospice care. After graduating Michigan, she got to live her dream in New York City. She requested to be cremated and no religious services. Her brother, Kerry, may plan a memorial service at a later date. Location is undecided. Click here to see Maggie (Margaret)'s last Profile entry.